The Manitoba government's plan to close four Lake Winnipeg harbours, in an effort to eradicate invasive zebra mussels, was received with anger and uncertainty by fishermen, boaters and others in the area Thursday night. The Manitoba government's plan to close four Lake Winnipeg harbours, in an effort to eradicate invasive zebra mussels, was received with anger and uncertainty by fishermen, boaters and others in the area on Thursday night. About 50 people attended a public meeting in Winnipeg Beach, Man., where officials outlined the plan to dump potash into the harbours at Gimli, Winnipeg Beach, Balsam Bay and Arnes, effectively shutting them down from mid-May to mid-June. The liquid potash aims to eradicate the small invasive mussels, which were first spotted in Lake Winnipeg in October 2013, according to the province. Officials confirmed that a fifth harbour in Lake Winnipeg has zebra mussels, but staff would try to remove them manually rather than use the liquid potash. The plan still needs federal government approval before it can go ahead, and staff must wait until all the ice melts from the lake, the province has said. But many of those who came to Thursday's public meeting said they were not consulted by the province well before the plan was unveiled, the CBC's Jill Coubrough reported from Winnipeg Beach. Some said they had only learned about it from the news, when the plan was announced late Wednesday, and others said they had known for less than two weeks. Many people also questioned provincial officials about the effectiveness of the liquid potash treatment, with most in attendance saying they weren't convinced treating the four harbours would clean up Lake Winnipeg. Some said they're convinced the zebra mussels problem is much more widespread and is essentially a lost cause. Concerns were raised that closing the harbours would cost about 100 Lake Winnipeg fishermen their spring catch. "It's a complete loss. You have three weeks in the spring, when the water is cold, to catch your fish," Rob Kristjanson, a commercial fisherman in Gimli, Man., told CBC News earlier Thursday. It could also prevent sailboats, leisure watercraft and other boats from using the closed harbours, said Gimli harbour master GordGowie, who raised safety concerns during the meeting. Zebra mussels, an invasive species, were first spotted in Lake Winnipeg in October 2013, according to the provincial government. Manitoba recently declared victory in its first battle with zebra mussels. (CBC)"If there's any boaters on the lake, in inclement weather, and need a safe port, they're not going to be allowed to come into the harbour," he said. "I just hope that nobody gets injured or worse." 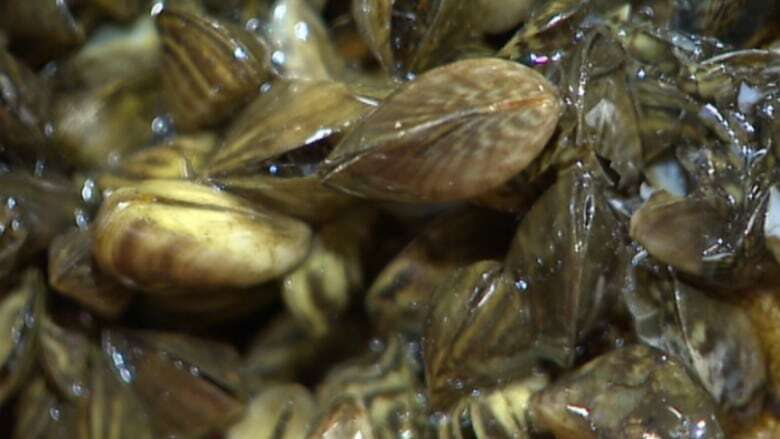 The province defended its potash treatment plan, arguing that the zebra mussel infestation is in its early stages and something must be done. "If nothing is done and we don't make this application, the situation will certainly get worse," Conservation Minister Gord Mackintosh has said. But those at the meeting said if the province wants to try the potash treatment, it should not come at the expense of local industry. "Shutting the harbours is essentially telling us we don't have a livelihood," said commercial fisherman Kris Isfeld. Provincial officials said they will take the feedback from the meeting and try to minimize the impacts of the treatment on local stakeholders. One idea that has already come up is to stagger the harbour closure dates. More meetings are scheduled to sort out details.